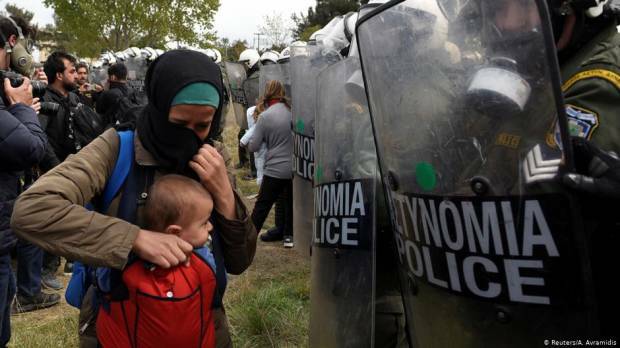 In early April, Greek police near the northern city of Thessaloniki used tear gas to prevent refugees from making their way to the border with North Macedonia. The refugees were headed to Central and Western Europe, driven by a series of false reports on social media that the border crossings to North Macedonia and Albania had been opened. Around 2,000 people believed the rumor and headed for northern Greece. After three days, the last of them gave up and returned to refugee shelters. Many of the roughly 70,000 refugees in Greece and the Western Balkans want to travel further north, but numerous obstacles stand in their way. North Macedonia and Hungary erected barbed wire fences on their southern borders years ago. Meanwhile, Bulgaria is known for its harsh treatment of refugees. Human rights organizations and the European Commission have accused the country of violating European Union asylum laws. Undeterred, refugees have established an alternative Balkan route. The starting point for this route is still Greece. According to the United Nations’ International Organization for Migration (IOM), around 60,000 refugees live in residential facilities or refugee camps in Greece. Aid organizations have criticized the conditions in shelters on the Greek islands near the Turkish coast, saying there is not enough space and the refugees have no access to clean toilets or water. Significantly fewer refugees have reached Greece via the eastern Mediterranean Sea since the 2016 agreement between the EU and Turkey on better monitoring of the maritime border. According to the EU’s border protection organization, Frontex, 34,000 refugees nevertheless made it to Greece last year, while 5,600 have already entered the country this year according to the IOM. As the temperatures rise more people are likely to risk the dangerous crossing — 174 people died in 2018 and at least a dozen have already died this year. Just this month, three dead bodies washed up on the island of Rhodes.